Swimming pool - Come and swim at Ackersate on the Veluwe! The pool is closed from October 27th, 2018, until the end of March, 2019. We look forward to seeing you then! Are you on holiday at Vakantiepark Ackersate? Then we have free tickets available for swimming pool De Heuvelrand in Voorthuizen. 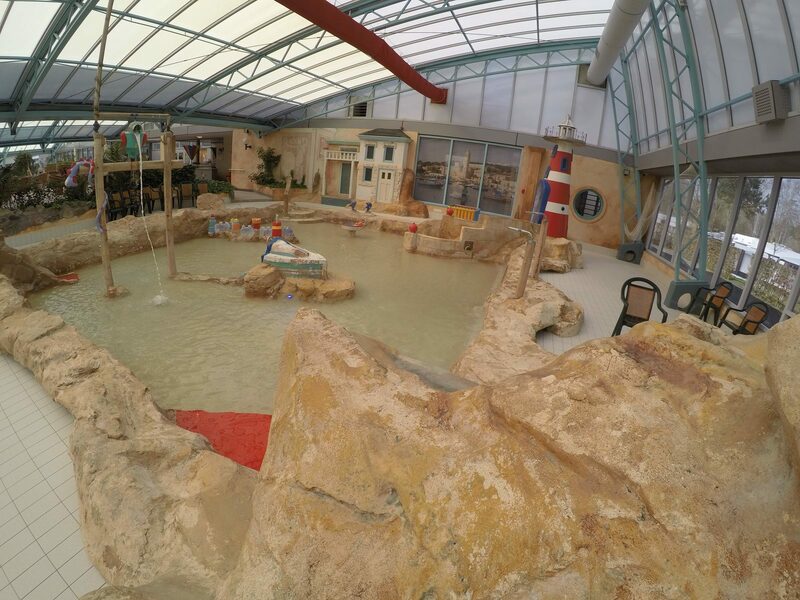 The indoor swimming pool has two super water slides and four pools. You can enjoy swimming in the 'big' pool, or relax in the whirlpool. Children can enjoy themselves in the children's pool. 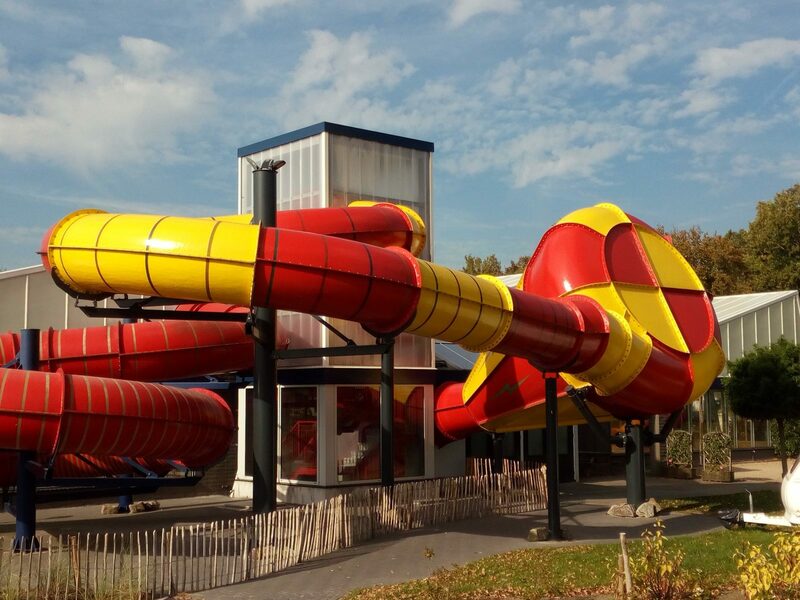 Here the two small slides and fun fountains provide extra splashing fun. And for the little ones, there is also a Mediterranean splashing pool. During hot summer days, the roof at the pool can be partially opened. 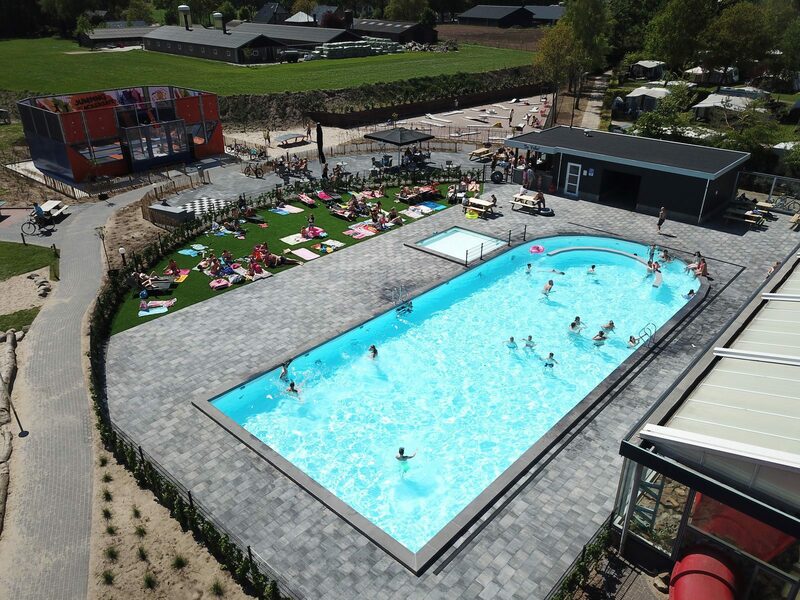 In addition to the indoor pool, Vakantiepark Ackersate also has an outdoor pool! When it is hot outside, you can cool off in the refreshing water. During colder days, the water in the outdoor pool is heated. 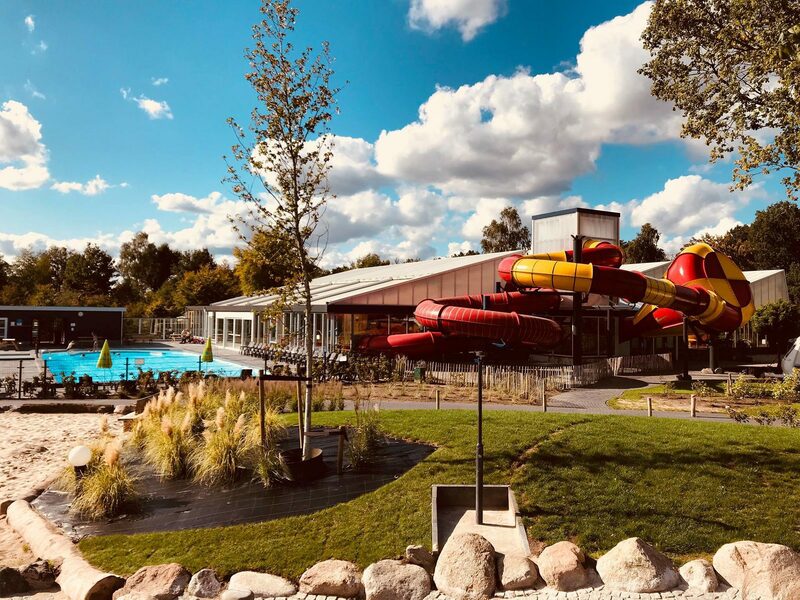 (from October 1st, the outdoor pool will no longer be heated) The rapids in the outdoor pool provide an extra challenge for the real swimmers. Are you not on holiday at our park, but would you like to come and swim? That is possible! Read how it works below. All visitors and non guests can come and swim. The entry price is € 5.00 per person. Would you like to come and swim more often? We have 12-time passes for sale for € 50.00. These are valid for a year. Are you having a children's party at our pool? Click here for more information..
Access to the pool can be arranged at reception (and at De Vallei during the holidays) at Vakantiepark Ackersate. You can enter through the access gates with a finger scan, or a "day wristband". In the mornings, from 9 until 10:30 a.m., we have swimming for seniors. Are you a senior citizen, and would you like to come and swim laps, but are you not staying at Vakantiepark Ackersate? Even then, you are very welcome! If you would like to come and swim laps more often, you can buy a special 12-time pass for swimming laps. This pool pass is valid for a year, and costs € 40.00. The outdoor swimming pool of 10 by 25 meters offers hours of swimming fun. Float along the faster currents or speed through it. In the Super Slider slide you will slide down full speed. Time to go again! A paddling pool for the little ones. The pool is 10 to 30 centimeters deep, so they can splash around by themselves (under supervision). The paddling pool is 7 by 7 meters and has diverse play equipment. The large indoor swimming pool of 10 by 20 meters is the stuff of fantasies. Dive to the bottom or climb onto the inflatable boat that's sometimes in the pool. Have a relaxing soak in this sumptuous bubble bath. Nice and warm and bubbly. 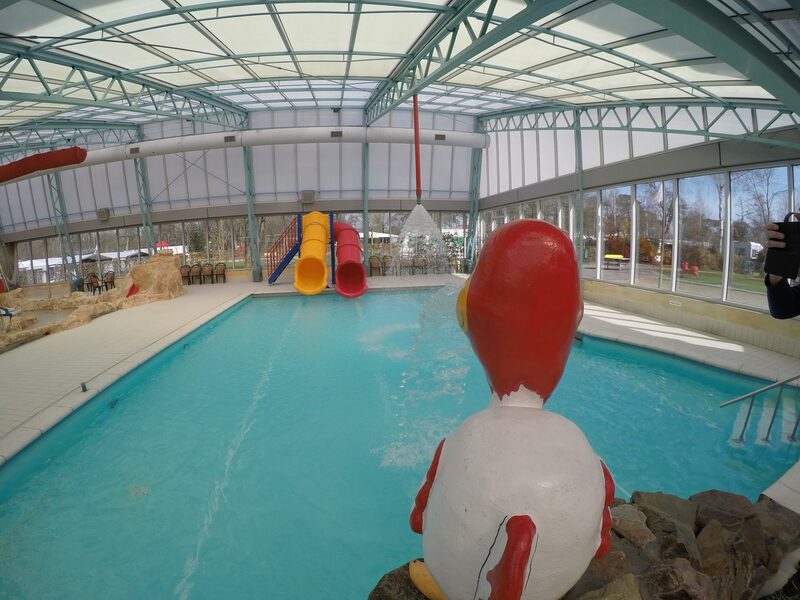 With its depth of 70 centimeters, the children's pool is suited for young swimmers. The pool is 9 by 7 meters, and has two fun slides. There are also several small fountains for extra splashing fun. 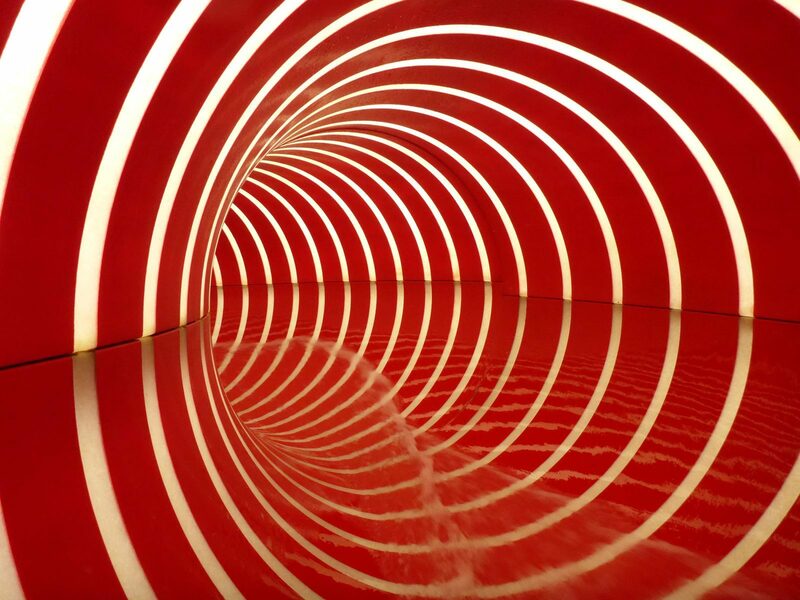 The Crazy Cone is a slide with a cone. You will slide down this slide from left to right, following the flow of the water. Have your children's party at Holiday park Ackersate! Come play, swim, bounce on the trampoline and have a meal!